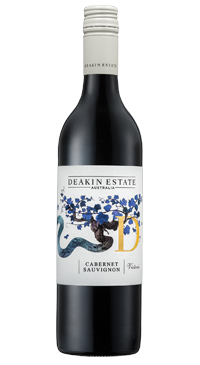 Deakin Estate is a family owned estate with vineyards near Mildura, in north west Victoria, Australia. Here, the Murray River runs through the land, nourishing the region and the vines. Deakin has 217 hectares under vine, resting alongside extensive orchards of oranges, avocados and mangos. This is a smooth and rich Cabernet Sauvignon with flavours of blackcurrant, plum, hints of chocolate and spice. The fruit is ripe, but the residual sweetness is minimal, at just 2.0 g/L, making this an appealing and full bodied dry red at a great price point.